“Backpack, Backpack, Backpack, Backpack.” Load up your backpack and bring the family to Discovery Cube OC to explore the ‘Dora & Diego Let’s Explore’ exhibit. Your children will be immersed in the world of their favorite television series “Dora the Explorer” and “Go, Diego, Go,” while visiting Discovery Cube OC until May 15th. I brought my younger son to explore the exhibit over the weekend, and while I thought that he might be a little too old for it at first (age 9), he had so much fun that he didn’t want to leave. The exhibit starts with families being greeted from Dora and Boots which makes for a perfect photo opportunity for parents. Once we were inside the exhibit, there was a giant pirate ship for children to climb, a giant yellow car to pretend to drive, a toddler play area, and more. My son navigated towards Tico’s Tree and car where he played with Swiper while swiping the nuts (orange balls) and watching them shoot up and over into Tico’s basket. My son could have does this for hours! His other favorite part of the exhibit was the animal rescue center. In the center, children are encouraged to pretend to be a veterinarian and help cure the injured animals. There are stuffed animals along with everything children need to be an animal rescuer for the day. Once we were done playing with Swiper, and exploring the the animal rescue center, my son got all of his energy out while running around the rainforest maze. There is a mini rock wall (perfect for toddlers), monkey bars, and interactive learning stations. Your children will feel like they are right in the middle of the rainforest while playing. The one thing that stood out to me about this exhibit was how there is so much for toddlers to do. There is Isa’s Flowery Garden where toddlers can touch and feel pretend flowers/butterflies, and use insect puppets on a nicely padded surface. Then there is the purple planet toddler slide and a rocket ship with interactive experiences. We ended our visit by getting a healthy snack at the Bean Sprouts Cafe before going home. The ‘Dora & Diego Let’s Explore’ exhibit is only at Discovery Cube OC until May 15th. Don’t miss bringing your children for an interactive day of fun. 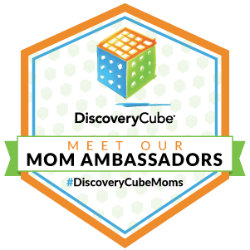 Discovery Cube OC is located at 2500 North Main Street in Santa Ana. The exhibit is include with the price of admission: $17.95 (adults), $12.95 (children 3-14, and $14.95 (seniors).